Four super-talented women filmmakers shared tips on how to produce and market a creative project. 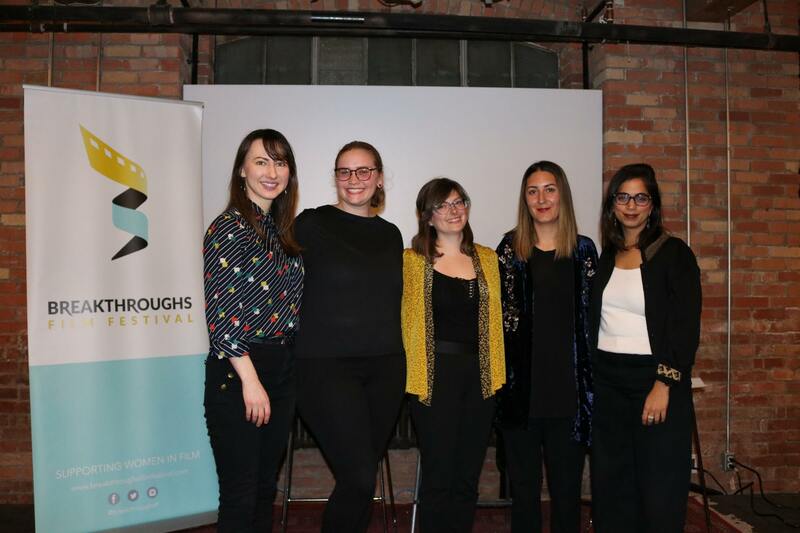 The panel was organized by Breakthroughs Film Festival and featured the insights of Rakhee Morzaria, Lisa Rideout, Alison Zimmer, and Sarah Kolasky. Hannah Donegan moderated the session and did a fantastic job of driving the conversation. Here’s four takeaways I learned from the session. All the panelists became inspired filmmakers in response to problems in their industry. Morzaria and Kolasky were dissatisfied with the lack of meaningful roles for young women in Canadian film and Rideout, who was once an academic, questioned if writing essays that only a handful of professors would read was the best way to raise awareness about an issue. Rather than waiting for their industries to change, they became creative leaders by opening up opportunities for themselves and others. Stories are fuelled by strong, unique perspectives. Whether it is crafting a storyline for a script or developing a social media strategy, the panellists emphasized the importance of authenticity. The strength of their creative work emerges from challenging how the film and television industry has historically represented women. They created stories and characters they wanted to see. This not only helped them craft affective stories but also discover like-minded audiences who craved the female-driven content they were producing. See, for example, Kolasky’s Great Great Great: it is about a woman who becomes ambivalent with her long-term relationship. There are few dark comedies that feature female protagonists who waver between finding new love or renewing a fine, if a little dull, commitment. All the panelists assumed significant risks by changing careers to become filmmakers. To learn their craft, they not only enrolled in educational programs but also produced a series of shorter works. Morzaria’s Note to Self is a hit web series on CBC Comedy. It took years of acting in Toronto theatre, working on her stand-up, and self-producing the first season of Note to Self before signing with CBC. Kolasky also developed a reputation in short film prior to attracting enough funding for a feature. She stressed the importance of always having a pitch for your next project ready to go because you never know when you’ll stumble upon an opportunity. So, while many of the panellists may seem like over-night successes, their creativity is a result of being highly motivated experimenters who keep building up their skill-set to complement their natural talents. The panelists filled the audience with optimism and inspiration. In my opinion, the most important aspect of the event was getting everyone in the same room. The audience, mostly comprised of emerging female filmmakers, left with a heightened sense of purpose. They identified others shared their passion for female-driven film. The panelists echoed this spirit because they received a lot of help along the way too. Making connections with others not only boosts motivation but also is fundamental for skill development. Creating a forum where emerging and established women can mingle and share ideas is a major contribution to Canada’s film scene.